This is the first instalment in a series on media relations measurement. I’m going to say something that could be perceived as sacrilegious among Canadian media relations practitioners. I’m not a fan of Media Relations Rating Points (MRP). For those who don’t know, MRP is a uniquely Canadian innovation. It is a relatively simple and inexpensive system for measuring publicity. Anyone can download a free Excel spreadsheet from www.mrpdata.com, and for a relatively inexpensive subscription fee, can generate audience reach data, which is supplied by News Canada. At the end of your campaign, you insert the names of newspapers, magazines, blogs, radio stations and television stations that picked up your story. The basic spreadsheet also has cells available for tone (whether positive, neutral or negative) and five other potential criteria that media coverage can be scored against, such as exclusivity of the story, the use of a picture, or prominence in the publication or newscast. My complaint is not about the tool. My concern is about how it’s being used. And, quite frankly, it’s leading to a laziness among Canadian media relations practitioners in the way they evaluate the effectiveness of their communication programs. During the past six months, I have judged some of the most prestigious awards programs in this country. I coordinated the media relations category for IABC’s Silver Leaf awards last fall. I participated as a judge in the media relations category of this year’s CPRS Toronto’s Achieving Communication Excellence (ACE) awards. This past weekend, I participated as a media relations judge in IABC/Toronto’s OVATION awards program. I have been judging media relations entries at local, national and international levels since I coordinated the entire Silver Leaf program in 1992. Over the past few years, I have witnessed a distinct deterioration in the discipline of media relations measurement since MRP was first introduced. Increasing numbers of entries at all levels are only submitting MRP “results” as their sole source of evaluation. Honestly, that’s not good enough. Our profession is about outcomes, not inputs. I have no qualms if your client is happy with MRP data as a sole source of measurement. As someone who has operated a successful business for the past 25 years, I understand the concept of giving clients what they want. But if you’re asking your peers for evaluation in awards programs (or in portfolio submissions toward earning your ABC or APR designations), MRP alone isn’t good enough. It’s not enough to say that 16,000,000 people may have been exposed to a message at a cost of one-third of a penny each. Did they get the message? And how did it influence their attitudes, opinions and behaviour? Did the program reinforce existing positive opinions? Did it encourage audiences to form opinions? Did it neutralize negative opinions? Did the media relations campaign move specifically identifiable audiences to action in ways that support the organization’s objectives? And how do you measure all of the above? In my mind, finding answers to those questions separates a practitioner from a professional. If you want to use MRP, fine. But please don’t try to convince a fellow professional that MRP alone is good enough. This is the second instalment in a series on media relations measurement. 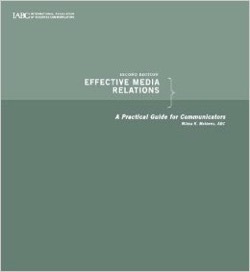 To help shed some light on what the state-of-the-art in media relations measurement should be, I thought I’d turn to Wilma Mathews, ABC, a long-time colleague and friend, and author of Media Relations: A Practical Guide for Communicators. Wilma has been practicing media relations for … well, let’s just say quite a few years. When it comes to media relations evaluation and measurement, Wilma says our industry is certainly better off than it was even five or ten years ago. For many years, media relations practitioners relied on the simplistic output measures of counting clips and adding up circulation. From there, the process evolved into impressions which, from her perspective, means pretty much the same thing as circulation and viewing audience. Next, the advertising value equivalency (AVE) was born, which she points out is a term that’s not even listed in theDictionary of Public Relations Measurement and Research. She believes the AVE was adopted as a matter of convenience (and I suspect she would say something similar about Media Relations Rating Points). It was a simple way to state some perceived value of media relations to management groups. But to her the AVE is a completely abstract number that has no correlation to any activity because advertising and media relations simply cannot be compared. To her, measurement is the end outcome — from an attitudinal or behavioural perspective. Did people buy the product? Did they vote the way you wanted? Did they form an opinion or change their minds? This is the third instalment in a series on media relations measurement. In this second part of my conversation with Wilma Mathews, ABC, I asked her where we needed to be as an industry when it comes to the strategic use of media relations. How do we develop objectives for a media relations campaign? How do we evaluate whether we’ve achieved those objectives? In a perfect world, how should people approach those challenges? Her advice was simple on the surface, but represents the complexity of media relations specifically, and organizational communication in general. She says that one of the challenges that many practitioners have with measurement is that they may start with a great objective — such as increasing the number of people who participate in a weekend run for cancer research from 10,000 to 12,000 — but their evaluation focuses only on the media clippings they generate. They forget to go back and count the number of people who actually participated in the run. This goes back to her belief that there is a clear distinction between evaluation and measurement in media relations. Counting the clippings is a form of evaluation around the process. Determining how many people participated in the run is a measurement of outcomes, and therefore success. Wilma believes that it is incredibly unethical to tell a client that a campaign was successful because it generated a million impressions when the objective was to get more people to participate in the food drive, vote for a candidate, or other potential outcome. There are those who may try counter her argument by saying that it was the client who wanted those media relations results — such as being a guest on certain television programs or being above the fold on the front page of the business section. Therefore, according to codes of ethics governing public relations (whether PRSA, IABC, CPRS or CIPR), the media relations practitioner has done his or her job. “If that media plan is solely about getting the boss above the fold on the front page of the business section and nothing else, then that’s ok,” she replies. “The objectives may be that (the client) is looking for media support for the product launch, and (the media relations practitioner) will write an objective that says they want to generate 1.5 million impressions. And without bottom line measurement, the job is less than half done.